I have created a Modern UI App for Windows 8/8.1 Preview that serves as a quick way to see hot topics in the community discussion categories for Microsoft Windows and Surface. This is a FREE App. Main interface, supports images when present. 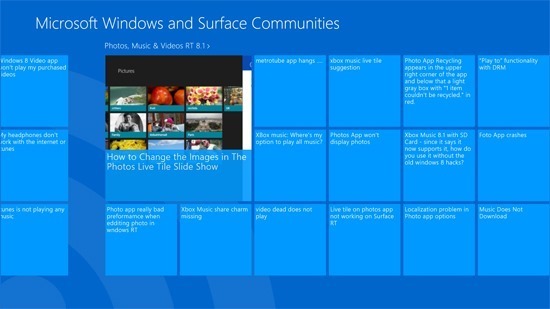 Windows and Surface Community Reader relies on feeds provided by Microsoft, which is currently limited to 40 articles per specified target. 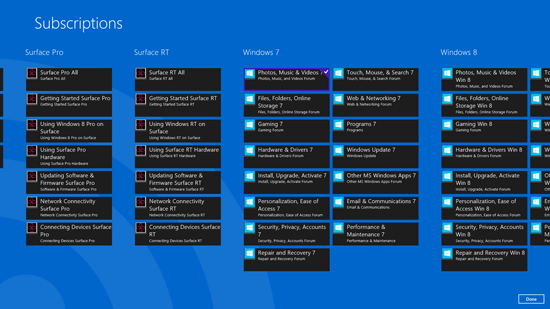 I selected ALL Questions and Answers for Windows/Surface Version/Product Categories by Topic and Apps/Topic as the level of detail to expose. Because this is a feed based app, new posts/replies need to be made in the web browser. To view an entire thread, view an individual article and then select the hyperlink which will open in Internet Explorer so you can participate fully. Microsoft sends items to a feed based on activity, which included replies being marked as helpful, edits, marked as answer – any change made. The feed display reflects this. 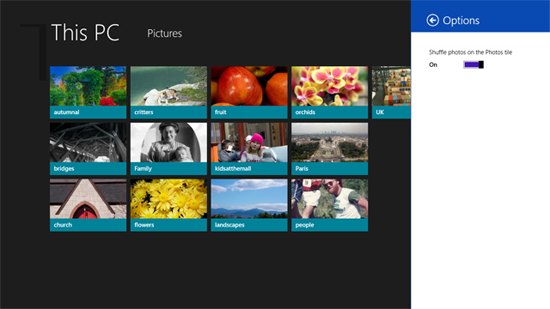 If you delete an image from your library, the Live Tile does not immediately sync and select a new picture to replace it. This was an issue in the original Photos App in 8.0 and Microsoft did not fix this in 8.1. You have to wait 24 hours after the last tile refresh for new images to appear. 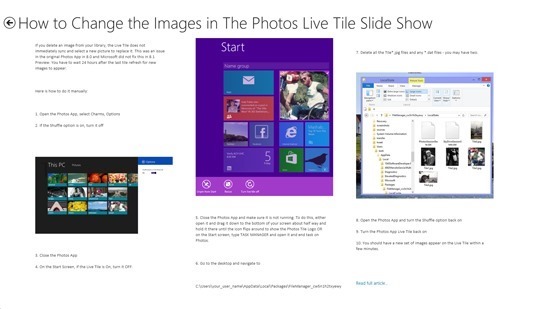 You can use the info below to change the images displayed on the Photos App Live Tile any time you wish to make a change. You still cannot pick and choose what is displayed, unfortunately. 4. 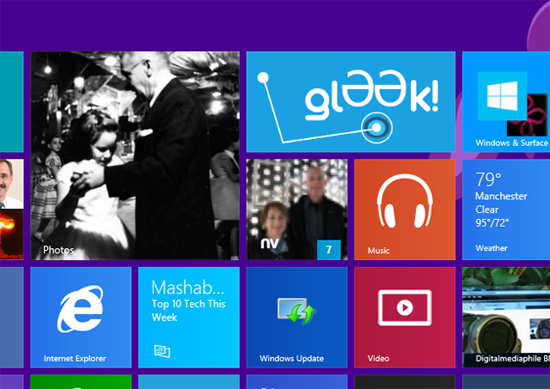 On the Start Screen, if the Live Tile is On, turn it OFF. 5. Close the Photos App and make sure it is not running. To do this, either open it and drag it down to the bottom of your screen about half way and hold it there until the icon flips around to show the Photos Tile Logo OR on the Start screen, type TASK MANAGER and open it and end task on Photos. 7. 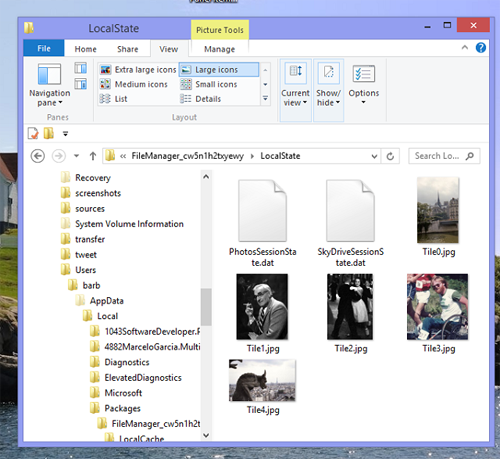 Delete all the Tile*.jpg files and any *.dat files – you may have two. 10. You should have a new set of images appear on the Live Tile within a few minutes. 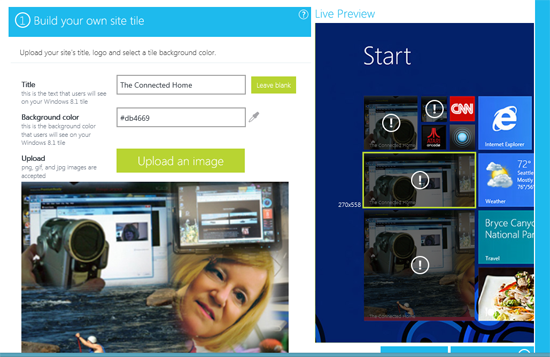 As you can see if you compare the cached tiles above to the Live Tile on the Start Screen below, a new set of images will start to appear on the Tile. 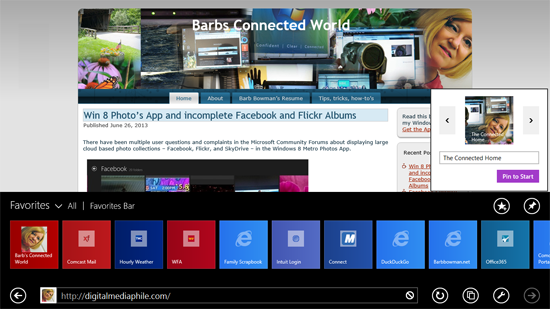 While I have a stand alone Windows Store App for this blog, I wanted to experiment with and share information on new functionality on the Windows 8.1 Preview with the Modern UI version of IE that allows site owners to push content (via RSS) as a Live Tile if a visitor elects to pin the site. 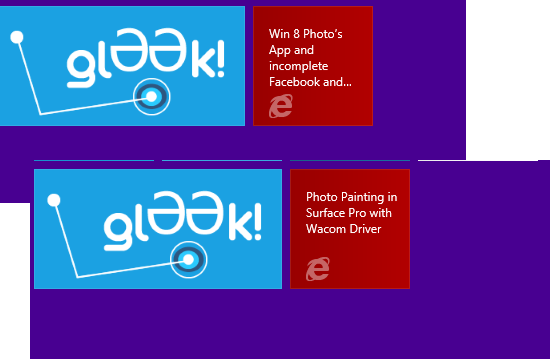 One of the things I noticed in the Windows 8.1 Preview was that the familiar push pin tack no longer appeared in the position it occupied in Windows 8 RTM (it was missing) when browsing the Internet. I had previously done a site icon for folks using IE 10 and lower (you can see it lower left corner of above screenshot). When I navigated to the site in my Favorites (Favorites Bar or any folder under Favorites) the option appears to Pin to Start. To get started, visit http://www.buildmypinnedsite.com/ where you will find a menu driven web app. 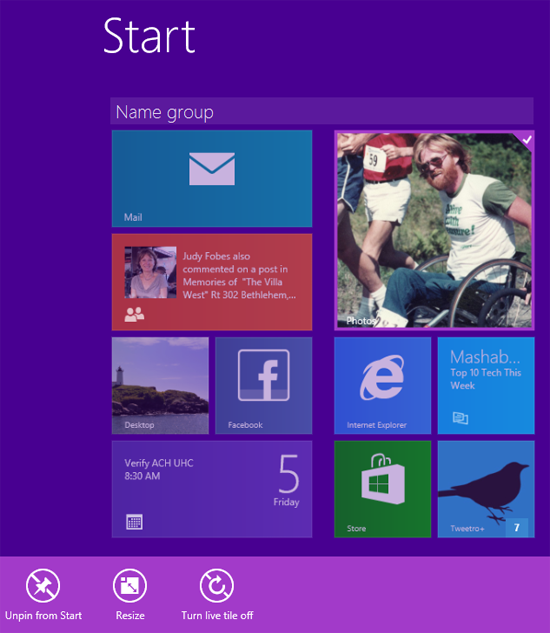 You can customize the background color of the tile, select a Title, and upload and crop images that will be used for the four supported tile sizes on Windows 8.1 Preview. Then, you need to supply the full URL to your RSS feed. Next, you will be given the HTML markup to add to your site <head> section (place this in header.php in WordPress if you are a WordPress blogger on a self hosted site). Finally, upload the files which are presented in a downloadable zipfile to the root of your server. The end result when visitors pin your site in IE 11 from the Start Screen is a Live Tile that pulls from your RSS feed that display as follows.